Estalagem A Quinta is a 4 star estalagem (residence), with 11 comfortable rooms, set in a peaceful environment surrouded by mountains and beautifull gardens. The clean hotel was started in 1997 and has a main building with the reception desk, rooms and entertainment room (billiards) and a restaurant in the second building. Santo Antonio da Serra, shortly "Santo da Serra", is probably the region is Madeira that gets the least of sunshine. There is an outdoor swimming pool but it is seldom used. The hotel allows short stays (1 night). Online dieses Hotel reservieren ? The hotel is situated in Santo da Serra, well known for its golf course. Santo da Serra is only 6km away from Santa Cruz and the international airport of Madeira. In the village there is a nice park, a perfect place to break the day with a morning walk ! From here it is also easy to reach the Pico do Areeiro (12km) or to make a tour towards the beautful Portela. The rooms have no balcony, but in all honesty, i've stayed here 4 times already and never needed one. The weather in this region can be quite bad, especially in the evenings. Continental breakfast is served at the table in the restaurant. It includes cofee, cacao and orange juice, bread with cheese or ham, jam and fresh fruit. For dinner the traditional Bacalhau com Natas can be highly recommended. Remarkably is that the menu also includes meat dishes such as steak and spare ribs but i still have to see the first porc in Madeira. The owner of Estalagem A Quinta has also 2 holiday homes (Casa Catarina and Casa Cristina) not far from the hotel and also an apartment in Porto Santo. 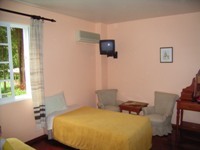 A good hotel to spend one night with a very acceptable price pro quality (60 Euro per night per double room + breakfast). Everything is very clean, maybe too clean because in the entrance there is always the smell of bleech or other cleaning products. We've been here 4 times already, mostly because it is a cheap hotel and perfect for those who just want to eat and sleep. Note that if you fly to Madeira using a charter, then it is always possible that the flight schedule may be subject to changes. The airport is not far way and therefor the hotel is also interesting for those who arrive on Madeira late in the evening or those who go back home in the morning. For this reason it is also a perfect hotel for the first or the last night of a Madeira Island tour. Hotel Alpino Atlantico in Canico de Baixo. Poussada dos Vinhaticos in Serra de Aqua. 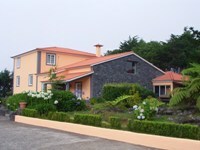 Hotel Moniz Sol in Porto Moniz. Hotel Monte Mar Palace in Ponta Delgada. Estalagem a Quinta in Santo da Serra. Hotel Vila Gale Santa Cruz.